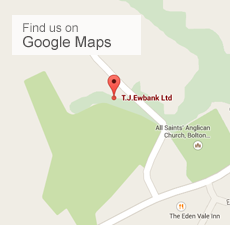 T. J. Ewbank Ltd is a family run business based at Bolton, Appleby-in-Westmorland, Cumbria. The business consists of Agricultural Contracting, the manufacturing of Sheep Identification Tags and started the processing and sale of Firewood in 2007. In March 2012, the company became the first log processing business in Cumbria to be awarded the prestigious HETAS Quality Assured Fuel Accreditation. The standard means that we have been recognised for supplying high quality firewood with a moisture content of less than 25%. HETAS is a not-for-profit company with a remit to encourage the safe and efficient use of solid fuel and biomass heating. The HETAS Quality Assured Fuel scheme is the only Government supported fuel quality assurance scheme, with additional support by the Biomass Energy Centre and the Forestry Commission. Since starting our firewood business in 2007, we have worked hard to achieve consistent quality standards. Now, our attention to detail, strict production control and excellent customer service has been recognised by the HETAS approval. Moisture content is very important as unseasoned wood – or wood which has not been dried out properly – can be very inefficient. It uses most of its energy drying out in the fire before releasing any heat into the room, gives off more smoke and releases tars in the chimney which means it will need cleaning more frequently. Well-seasoned logs will give out twice as much heat as unseasoned ones. We cut our logs and then store them to season naturally for over 12 months before selling them. With more and more people now using environmentally friendly biomass boilers and woodburning stoves, customers can be assured of a consistently high quality wood fuel supply. Trees absorb carbon dioxide as they grow, therefore wood fuel is considered carbon neutral. As part of our continuing commitment to the environment we are proud to support the planting of trees in Cumbria by working with the Woodland Trust and the Diggin’ the Trees volunteer group who receive a donation from every dumpy bag of wood that we sell.